Do you want reliable and affordable roofing in Silsbee, TX? ECO Commercial Roofing can assist you with all of your roof service requirements, so give us a call at (833) 200-0571. Customer service is a primary goal of ours, and we can provide you with nearly any kind of roof assistance you may need. Not only are we reliable Silsbee roofers, we are also active members of our local communities. Our roofers are always happy to assist our clients with any questions or worries about roofing systems, and we provide a selection of solutions as well. For expert, kind, and helpful roofers, you can always rely on ECO Commercial Roofing! A trustworthy contractor is essential when it comes to any services on your home or business. Every one of our contractors undergoes training to industry standards, and we are sure to only use top quality products from brands like Conklin. We understand that the roof you pick can impact the price of your property as well, so we offer several different roofing varieties for you to choose from. When choosing, remember that while the style plays a significant role, that the extended benefits also require serious consideration. The type of roofing you pick will ultimately rely on your budget, as well as the kind of building you are needing to protect. We have plenty of quality options to choose from. Dependable roof services are our number one objective, and we can deliver that in the form of repairs, replacements, and installations as well. Our expertise enables us to service any kind of roof, including business, industrial, and residential too. Our commercial offerings are ideal for businesses, malls, apartment complexes, and similarly fashioned buildings with flat roofs. Flat roofs require a certain degree of skill in order to ensure the longevity of your system, as well as enduring resistance to moisture, protection from ponding. Industrial roofing is similar to commercial roofing, but these roofs require specialized installation, as well as specific material requirements if you want them to last long. Finally, we also offer reliable and affordable residential roofing services in a wide variety of styles. Roof restorations are our primary specialty, meaning we are no strangers to roof coatings. By utilizing top quality products such as Conklin, we ensure that your roof solution will endure for decades to come. We’re dedicated to supplying our clients with the very best roofing in Silsbee, TX, and we accomplish that with unbeatable craftsmanship, time after time. To find out more about our Conklin roof coatings, or to ask questions about our roof restoration methods, give us a ring at (833) 200-0571! 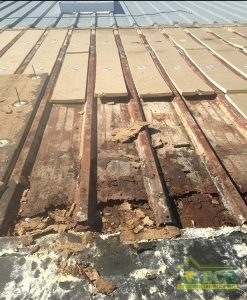 As experts, we often recommend roof restoration to our customers as a technique for repairing your roofing and protecting it from additional damages. We use Conklin roof coatings in the majority of our restoration processes, and with these coatings you can typically gain another 10 years for the lifespan of your roofing system. Save both time and money by choosing a quality roof restoration instead of a roof removal and installation. 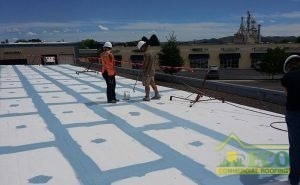 Our primary method of roof restoration relies on top quality Conklin roof coatings. These coatings come in a selection of different materials, and we are able to help you determine which one will work ideally for your needs. Various coatings provide different levels of adhesion, flexibility, and moisture resistance. Generally, we can even apply the roof coating without removing your previous roof material. To learn more, call our team today at (833) 200-0571! Acrylic Roofing Acrylic roofing is particularly flexible, and caters well to varying temperature changes. Among the many kinds of commercial roofs we can service, are low slope roofs as well as flat roofs. Correct installation is key if you want to avoid problems like leaking, punctures, or premature failure. When we create a flat roof system for a client, we build that system to protect and serve their building for decades. For all of your reliable commercial as well as residential roofing needs, call on the experts at ECO Commercial Roofing! You can locate our professional services and quality roofing in Silsbee, TX, as well as in the surrounding cities. Investing in a reliable roof for your building will certainly benefit you later on in that business. Give us a call today at (833) 200-0571 with roofing questions, or if you’d like to schedule an appointment with our expert roofers.